8:30am Tuesday the 25th November. I'm on Amtrack's regional train from Boston to NYC. Love trains. Last night I performed at Northeastern University, my last college stop for 2008. I'm giving myself December thru February to finish the first draft of my memoir. So excited at the prospect! I'm scheduling myself some knee replacement surgery in May, so I'll have a short spring touring season. I'm now booking dates for March and April only, so if you've been thinking about bringing me to your town to speak or perform, this would be a really good time to get in touch with me about that. The best email addy to contact me about booking engagements is: on_the_road at Earthlink dot net. Write soon! I saw wondrous things, met amazing people, and made many new friends over my past 2 months on the road. This photo is from a tech rehearsal for a peformance by Bent writers in Seattle, WA. 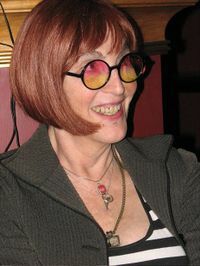 Bent is a queer writers' institute, the only one of it's kind in the world. My best guess is they are the vanguard of something akin to the Beat movement of the '50s. I'll post more about Bent and my other stops over the next few weeks. And I'm aiming to have a photo blog in place sometime in December. So, happy pre-Thanksgiving to you USA folks. To you and to everyone else, I hope you get to eat yummy food this coming Thursday. More soon. I'm at the University of Vermont, attending the 7th Annual Translating Identities Conference. Highest ever attendance: 700 queers and allies. The school was also hosting a day for prospective students and their families on the same day, in the same building. We were all treated to this signage. What joy! UVM isn't the only school to have instituted gender neutral bathrooms. Far from it. But this sign is the most out loud and proud reflection I've seen of the progress we're making. 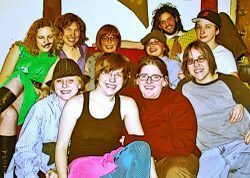 Queer students, staff, faculty and administrators around the USA have been working together to make life easier for the in increasingly large campus population of transfolk. 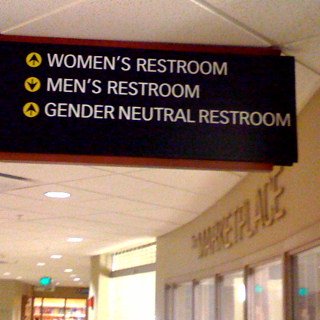 If you've got a picture of gender neutral signage on your campus or in your company, please post a link in the comments section, or let me know you've got one and I'll post it here. Yay UVM queers and allies!! Hello. Wanted to let you know it just LOOKS like I'm outta touch. I'm on the road--Twin Cities, MN--no time to blog big, but I'm twittering daily from my phone. You can keep up if you're not already by clicking the li'l "Follow me" button to the left. Four more days here in the land of my birth, then home to NYC before the next tour. So, no longish posts--but I do my best to keep my tweets fun! The title of this post is the title of an editorial that appeared in the UK Guardian about a month ago. My longtime friend, co-author and political standard bearer Caitlin Sullivan sent me the link. Please forward it on. In his editorial, Jonathan Freedland makes clear the high global stakes in the upcoming election. Most of the world is cheering for Obama, says Freedland. Despite the fact that we allowed a mean-spirited fool take office in this country in two elections, Freedland makes the point that until now, most anti-American sentiment has not been aimed at the average American. Rather, anti-American sentiment has been framed as anti-Bush sentiment. Generously enough, it seems that the world has given the American people the benefit of the doubt. But according to Freedland if we allow the ridiculous ticket of McCain/Palin to sail into office, our already shaky credibility in the world as Americans will be shot to hell. Sure, Senator Obama has a good lead in the polls, but this isn't the time to sit back and relax. The Republican campaign is fighting dirty to win. Our response has got to be an active drive for unity on the Left. Race has been plunked down on the table in the hopes of turning the tide to McCain. The Conservative Right is dragging the old radical socialist bogey man out of their old kit bag, further silencing the genuinely compassionate goals of the radical left. The solution seems clear to me. Even if race isn't our issue, even if we're not ourselves radical lefties, we've got to do the old Sixties thing and come together. We've got to embrace the Obama/Biden ticket as the clear choice of the American people. And we can't afford to drop the drive for unity once Obama has won the presidency. That would be really stupid of us. After President Obama is sworn into office as a result of lefty unity, we may very well have found the key to establishing an honest-to-goodness coalition that fights for safety, empowerment, health, and well-being on behalf of all world citizens—regardless of race, age, gender, class, citizenship, sexuality, looks, ability, religion, or ecological stance. Wouldn't that be something? There's never been a coalition like that in the history of humanity. 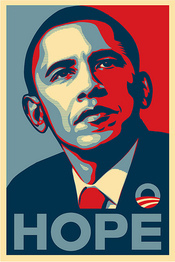 Senator Barack Obama has been talking about hope. Well, that's what I hope for. I hope you do, too. Once again, my apologies for not posting sooner. I've been in rehearsal for my new solo show that opens in Manchester UK in mid-May, and I've been getting all my ducks in a row for my upcoming HEAVY tour schedule this season. I'm posting the schedule here, and I really do enjoy meeting people from online, so if you're in any of the following towns, please stop by and say hey. The Queerest of the Queer—in America's Heartland! I've just returned from a visit to Knox College in Galesburg, Illinois. I was there as part of a trans-awareness weekend, which included an amazing drag show which included participation by one of the fraternities on campus, and and a genderfuck party in the frat house later. I was happy to hang out with a collection of perfectly delightful queers of all genders, sexualities, and persuasions.